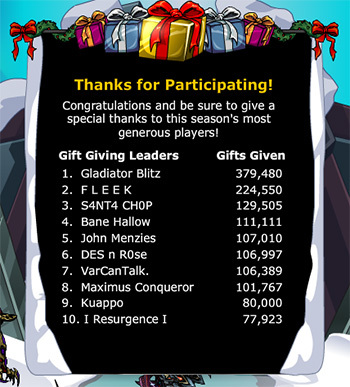 2017 reached it's epic conclusion in EpicDuel with the conclusion of our Gifting Event. Thank you all again for participating! Once again, you've blown us all away with your amazing generosity towards your fellow players! The top 10 have received the Cosmic Battle Yeti and the grand-prize winner, Gladiator Blitz claimed Nightwraith's Gamma Gear! There was a small problem with the Gamma Bot, but this will be fixed when the servers restart tomorrow. Although we are sorry to see the event leave, we will be updating the game tomorrow morning to restore the normal war cycle and remove the 15k Varium package. 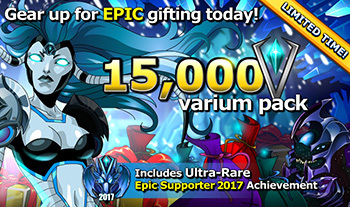 Today will be the final day to take advantage of the 15k Varium package and claim the Epic Supporter 2017 Achievement! The update will be between 9-11AM EST tomorrow, so if you want the achievement or 3k bonus Varium, act quickly! Thank you again for playing and DUEL ON!